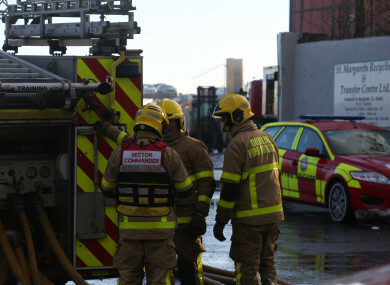 DUBLIN FIRE BRIGADE has said it is implementing recommendations after an investigation into the alleged leaking of an exam for firefighters last year. In January 2017, more than 170 firefighters applied for positions as subofficers, which is the first rung on the promotion ladder in the fire service. The promotions are given based on interviews and a written exam. TheJournal.ie understands that the service received a report from a whistleblower claiming that a number of firefighters were told questions from an exam paper in the weeks leading up to the test. The details were alleged to have come through phonecalls and text messages. It is understood a complaint was initially made to the fire service’s human resources department and followed up with a protected disclosure by a firefighter. One source within the fire service said it had been alleged that favoured firefighters – in some cases friends or family members of higher ranking staff - were given the details of the exam. “They maybe did a job for someone or were someone’s mate or nephew – it was cronyism basically,” they said. They also said the average grade in the exam was above 90%. Another source said there was “a huge amount of anger” in the fire service when people heard that the test may have been leaked. People thought we had come into an era where that things were going to be different in the brigade and that it was going to be pure, honest competition – as much as it could be. Then it came out that it had been leaked and with some people [who scored highly], it was very apparent. A spokesperson for Dublin Fire Brigade confirmed a protected disclosure investigation was carried out and said “the recommendations from that investigation are being implemented”. The spokesperson did not give details of the recommendations, but it is understood they include the involvement of an independent body in future examinations. Email “Whistleblower claims details of Dublin Fire Brigade exam leaked to promotion candidates ”. Feedback on “Whistleblower claims details of Dublin Fire Brigade exam leaked to promotion candidates ”.